Also known as the old mine cut, the cushion cut diamond has been around for more than 200 years and a much preferred diamond after round cut because of its heritage. It dates back to the 19th century. Akin to the princess cut, a cushion cut diamond is square shaped with rounded corners. However, the cushion cut is special in the fact that it can come in a multitude of ratios, making it either square or rectangular. Cushion cuts are a perfect combination of the fiery sparkle portrayed by a round cut and the symmetry of a radiant cut. Because of the softer corners, the resemblance is more akin to a pillow, which has derived the name “pillow cut”. The romantic appeal and vintage aura of a cushion cut diamond is reflected in its larger 58 facets, which enhances the brilliance and fire. However these larger facets are more prone to show off the inclusions quite visibly hence it is recommended to have a better clarity grade while selecting a cushion cut diamond. Being one of the oldest cuts, the cushion cut diamond has a rich mining history that dates back to 19th century and were initially named after the Brazilian diamond mines. Once diamonds were discovered in South Africa, this cut became popularly known as the “old mine cut.” This earlier version had 33 crown facets and 25 pavilion facets which were quite larger. When it was first introduced to the jewellery market in 1800’s, this cut was one of the most sought after diamond shape for the better half of the first century, as it combined the best of opulence and symmetry. Until the beginning of the 20th century and before the advent of newer more angular cuts like asscher cut that reflected the new age trend, cushion cut diamond was the de-facto diamond shape. It is essentially a square cut with smooth-edged corners and larger brilliant styled facets resembling a pillow. Owing to its mining history and the refined traditional appeal, the cushion-cut diamond is desirable to those who prefer vintage-style rings and jewellery. The modern version of cushion cut is a blend of the old mine cut and a modern oval cut. Instead of 58 larger facets like originally crafted, the modern cushion cut has 64 facets, achieving a much greater sparkle and enhanced fire. POPULARITY:Until a few years back, it was hard to find cushion cut diamonds for sale outside estate sales and auctions. However, today because of its classy elegance, outstanding beauty and vintage appeal, the antique cushion cut diamonds are enjoying quite a bit of popularity. 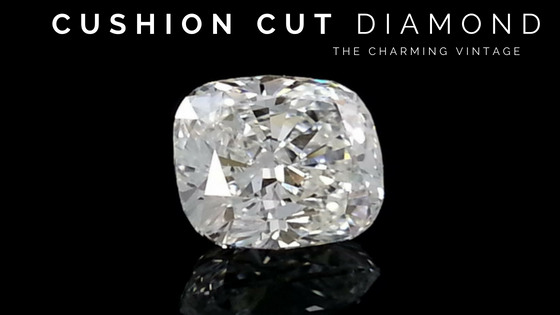 Proven by the fact that many celebrities including Jennifer Garner, Ashley Judd, Naomi Watts, and Ivanka Trump have been seen adorning cushion cut diamond jewellery. Being around for centuries, cushion cut is associated with some of the world’s most famed and largest diamonds, including the legendary Hope Diamond which weighs in at 45.52 carats, the rare yellow Tiffany diamond with 128.54 carats and the Regent diamond, a whopping 140.5 carats. Looking back at this rich history, vintage charm and the diamond cutter’s preference, cushion cut will continue to rule the jewellery market for decades ahead. Because of the elegant vintage charm and symmetrical lines of a cushion cut diamond, this shape looks perfect with an array of setting. However the best way to capture the nostalgic charm of this vintage cut is by classic four prong setting. As is with cushion cuts, if the diamond is particularly large with carat weight of more than 4.00, a four prong setting is not advisable for the safety purpose. 6 prong setting will stabilise the diamond while enhancing its charm. Cushion cuts are soft and romantic, so these diamonds will also look extensively grander in a vintage halo or side stone setting. PRICING:The ratio and proportions of cushion cut diverge more than most other shapes and hence the value fluctuates, and thus individual taste will dictate preferences. Similar to princess cut, a cushion cut also preserves maximum weight (almost 70% of its original weight) reducing it cost per carat value. So it is less expensive as compared to round and princess cut. Also similar brilliant square cuts like cushion tend to have more depth and its weight is concentrated at the centre of the diamond. So visually they look much smaller than round cut diamonds of same carat weight. This is another reason for low pricing rate. However once the carat weight reaches 2 carats, the prices hike up exponentially with every increase in the carat weight. In most of the cases premium price is associated with cushion cut diamonds at the higher end of the colour scale. Diamond with D-F color grades see a substantial price hike.Cushion cuts has an ability to retain their natural colour better than many other diamond cuts, which is why many of the eclectic pink, yellow and other fancy coloured diamonds are cut as a cushion. To get the clearest colour in your cushion, it is recommended to get at least a colour grade of H when you make your purchase. Also, because of its larger facets, inclusions are quite visible in the cushion cut diamond hence larger diamonds demand better clarity.